Failed to create pre created guest, Template "Template name"
Clones can be created correctly with built-in admin account only, but NOT with any other domain administrator credentials. Publishing Agent installed on Domain Controller. Additional configuration required. In the task pane, expand the domain node. 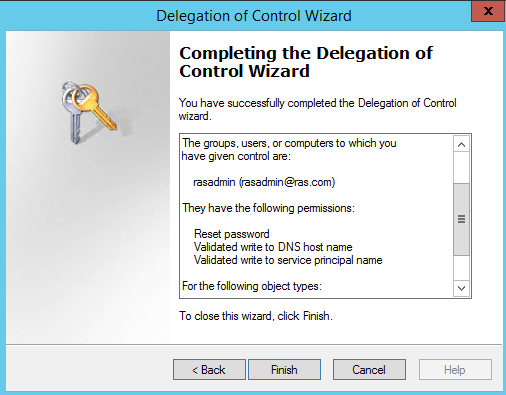 Locate and right-click the OU that you want to modify, and then click Delegate Control. Click Add to add a specific user or a specific group to the Selected users and groups list, and then click Next. In the Tasks to Delegate page, click Create a custom task to delegate, and then click Next. Click Only the following objects in the folder, and then from the list, click to select the Computer objects check box. Then, select the check boxes below the list, Create selected objects in this folder and Delete selected objects in this folder. Close the "Active Directory Users and Computers" MMC snap-in.